New Fabrics – Just Arrived! Have you noticed all of the Greek Key trim popping up on home décor lately? Decorators are using this stylish 2.25 inch decorative braid trim in so many areas of the home and office. We recently added six colors of this beautifully embroidered jacquard trim. 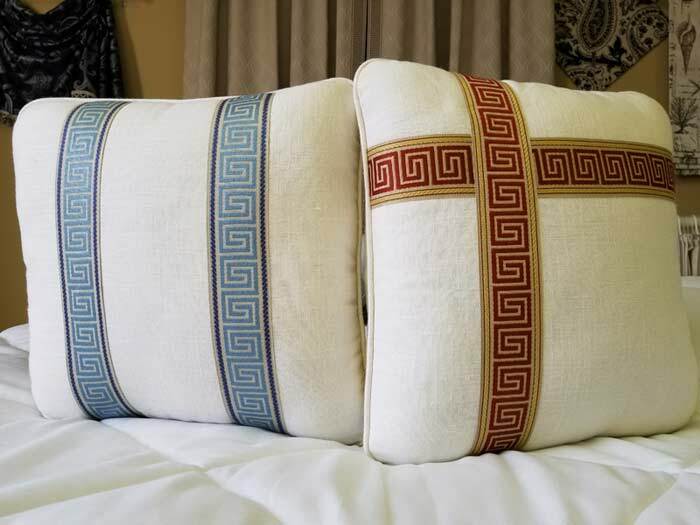 The design features a Greek Key pattern and is versatile enough to use on almost any item in the home. The most often overlooked room in the home is the master bedroom; which I don’t know about you, but next to work, it is the place I spend the most time in. When I moved in my home I spent the first year to two years furnishing and decorating my living room, dining room, family room, kitchen and then my two daughter’s bedrooms. Decorative pillows can make a huge impact in the decor of your room. Adding a few pillows is an easy way to add a bold statement or flair that can be easily changed in and out. Accent pillows are a must have in any home. Decorative pillows can in many shapes and sizes and look great when you combine them as such. What is great about decorative throw pillows is that they can show off your personal style. Pillows can be fabricated in a reserved manner with just a simple fabric cording around the perimeter or for a bit more lavish look a twist cording can be used. Some of the most popular choices in embellishing pillows are bullion fringe and loop fringe that will give the pillow much more character. Along with adding decorative trimmings to a pillow you can also add fabric covered buttons to the center of pillow. We recommend using square pillows on couches and really any shaped pillow will work on a bed. Accent pillows can take a bland room and transform it into an inviting atmosphere. So where your pillows are concerned… be creative and show your style! An easy way to add a splash of color to your room is with decorative throw pillows. Throw pillows are especially fun for kids’ rooms. Add a few brightly colored pillows and make their room a relaxing place to hang out with friends. Add a touch of class to your own bedroom with a few pillows finished in elegant fabrics and trims. We’ve got fabrics for any style, if not, we will use your fabric! Add some color to your living room or bedroom with a few throw pillows. Throw pillows bring warm colors and a comfy feel to any space in your home. With a variety of patterns and colors to choose from you are sure to find pillows that will match your decor. Whether for looks or for cozying up, our decorative accent pillows make a perfect finishing touch to any room. Mix and match the fabric patterns on your pillows for a fun inviting look.